When assigning blame for our nation’s persistent poverty problem, many policymakers tend to focus on underlying demographics or behavior of the poor—factors like racial background or the rise of single parent households, instead of the stark economic reality the poorest Americans have to contend with. 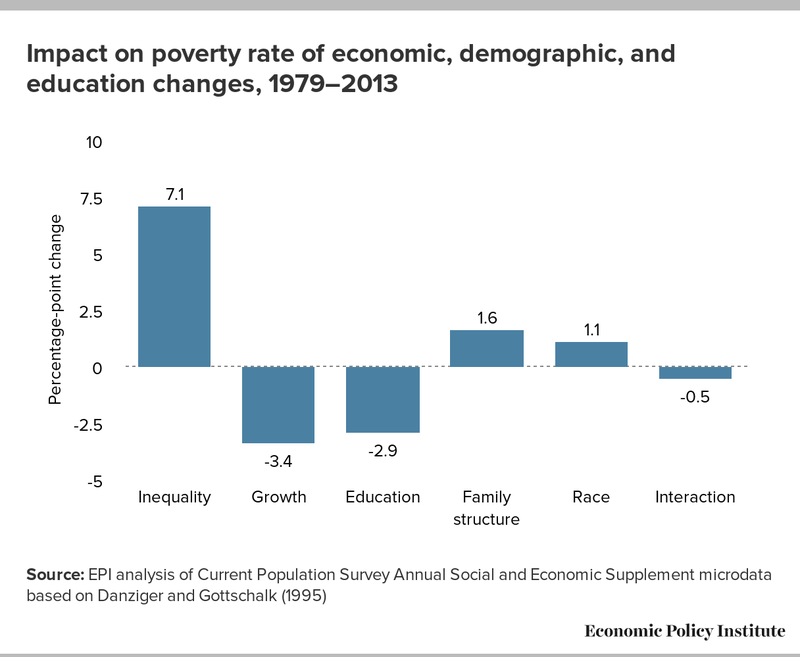 While demographics and individual behavior have a place in the policy discussion, growing inequality is the primary reason the poverty rate has remained elevated over the last several decades. The chart below breaks down the poverty rate and shows how demographic and economic factors affected the poverty rate between 1979 and 2013. Since 1979, increasing inequality has been the largest poverty-boosting factor, outweighing racial identity and family structure and completely eclipsing the effects of overall economic growth and educational attainment in driving down the poverty rate. Despite our growing economy and the fact that poor workers are now more educated than ever, rising inequality has worked to keep low-income people in poverty. This increase in inequality was driven by stagnating wages for low- and middle-income households (for example, 10th percentile real wages were actually lower in 2013 than they were in 1979). My recent paper, Broad-Based Wage Growth is a Key Tool in the Fight against Poverty, written along with Elise Gould and Will Kimball, looks at how the lack of wage growth for low- and middle-income families fuels poverty. We show what could have happened to poverty if wages had actually grown over the last several decades and if the poor and the middle class had shared more widely in the gains made by a growing economy. We find that adopting policies to promote full employment and significant wage growth could bring down poverty as much as 4.2 percentage points—bringing 11.2 million people out of poverty. It’s not fair to say the poor aren’t holding up their end of the social contract when almost two-thirds of employable poor people work and over 40 percent work full time (and their incomes have become more and more dependent upon wages over time). The truth is that the economy the poor are working in—an economy which has grown more and more unequal over the last several decades—has made it harder and harder for them to get by. Instead of focusing on the characteristics of the poor when assigning blame for poverty, we should examine the policy choices we have made that led to such an unequal economy. Going forward, we should focus on policy solutions that will spur wage growth—such as raising the minimum wage, targeting full employment, strengthening worker’s bargaining power, and updating labor standards—in order to make our economy work for all.